The operation began on March 25 with multiple air strikes at around 17:40. 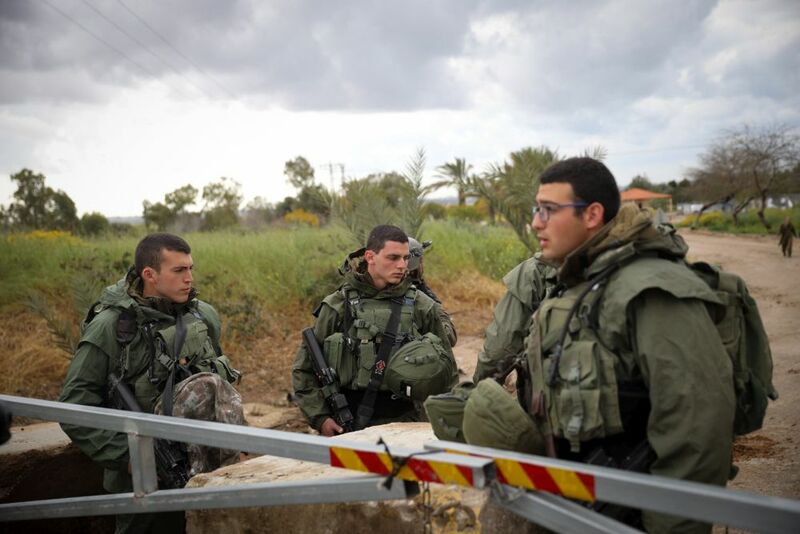 Terrorist leaders and commanders had already disappeared into underground bunkers in the Gaza Strip in anticipation of a large-scale IDF operation following a rocket attack on central Israel and a spiraling series of terrorist assaults on Israel civilian and military targets. A short time earlier, the IDF stated: Explosions will soon be heard as part of IDF offensive action. Extra vigilance is advised in line with directives.” The heads of local towns and districts in the South reacted by ordering their populations to open shelters, close schools and call off outside activity. Throughout the day, the IDF built up its strength along the Gaza border fence and mobilized reserves, while consolidating the Iron Dome ring of anti-rocket batteries ready to intercept Palestinian rocket fire at population centers including the Tel Aviv region. The rail service between the southern town of Ashkelon and Sderot, just outside the Gaza Strip, has been suspended and car traffic thinning out on the roads. Sources inside the Gaza Strip are describing preparations for a broad confrontation between the Hamas, Islamic Jihad and other Palestinian terrorist groups and the Israeli military. Their bases and command centers have been evacuated and equipment removed. Hamas and Jihad have gone to ground in their large network of underground bunkers. Their rocket arrays are on war preparation. The rocket attack on Moshav Mishmeret, a town 20km northeast of Tel Aviv, was traced to a Hamas pad near Rafah in southern Gaza, and identified as a home-made weapon with a range of 120km. It wrecked a home and injured seven people, three of them children, and inflicted more serious injuries on a woman of 60. They got off with relatively light injuries due to having reach the fortified room in their house in the nick of time before it took a direct hit. The IDF’s last major counter-terror assault on the Gaza Strip was Operation Protective Edge on July 8, 2014. On July 17, Israeli ground troops entered the Palestinian enclave. They are the enemy, they support the enemy treat all as such! All out victory or stay home and quit putting soldiers in danger. Turkey MUST acknowledge the Armenian Genocide where 1M+ Kurds were murdered by Turkey. Ooops 1M+ ARMENIANS were murdered by Ottoman Turkey. Yes, but they have this extreme idiotic president, and Stalin-like purges, so there is also some serious punishment. The problem with Ottomans that they believe themselves being Europeans, but Turkey is in Asia, and they came recently from Mongolia. Doktorunuza reçete edilen herhangi bir ilacın yararlarını ve yan etkilerini sorun. Paranoya ve şizofreni için ikinci kuşak ilaçlar genellikle tercih edilir, çünkü ilk kuşak antipsikotiklerden daha düşük ciddi yan etki riski oluştururlar. Allah bir kurgu, Muhammed de bir yalancı. tek gerçek Tanrı, İsrail için savaşacak, onu koruyacak ve hakaret edecek. Bomb Hamas without giving advance notice and when they are not hiding like rats and there underground bunkers. Time to show Israeli strength so we will once again be respected. Save the jet fuel and let the reserves stay at home. Just keep pounding Gaza with artillery. After 1000 rounds see if Hamas wants to talk. If not fire another 1000 rounds. What is there to lose? Gaza will be reduced to rubble. Islamic squatters must leave Gaza, now it is absolutely clear and a Quran requirement. Mohammad) : that “he who turns a dead land into life becomes its owner”. But, this stays true if they turn a dead land into life, not into death. The Prophet (peace be upon him) showed considerable interest in squatting and gave one of his companions land in Wadi Aqiq in Al-Madinah to cultivate. Some years later when a portion of it was not being used, the second Caliph Omar took that portion from his ownership. In this instance, both the giving and the taking away of the ownership rights were related to the land being used. In one of the interpretations of this Hadith `dead land’ is identified as one which, apart from not being owned, is also not being used for the benefit of a town or a village for grazing or for keeping live-stock . Now, can you show me the Hamas live-stock pasturing on the fields of Gaza? Just new operation with new name and bla bla bla, the Israeli army is a coward relying on planes and drones, they don’t know what a real war is. …says the naive little boy who never fought, anonymous hiding behind a keyboard. The mobilizations process is nearly impossible to keep from detection and this holds especially true in a nation the size of Israel. If these forces move to their “jump” locations, all they will be waiting for is the final order to move, if they have not already been given such an order. Hamas and others can observe this mobilization process and that will allow them to anticipate the level of response they are going to recive. At that point, they have 2 options, prepare for a proportional response on their side or attempt to deescalate through a 3rd party such as Egypt. So, the question becomes, what does Hamas decide to do? Arab leaders will not split on their quiet support for Israel as long as the picture is painted of this all being part of a greater plot / plan by the Mullahs in Tehran. Time will tell. Bunker-Buster bomb time or find the holes those rats are in and fill with just enough gasoline to burn them alive. Not just dead, but painfully dead. Hunt down those leaders and kill them and destroy their homes. If you burn down Hamas leaders then new leaders will arise and do the same. Nuke Gaza! I have taken it up the sphincter today from piggies more times than I can count. We can bomb them from 10000 meters like we usually do, but that never accomplishes anything. We can send in the Golani Brigade, but they’ll just get their faces beaten in like 2006. We have no hope. Time for another piggie in me… mom and dad were so right.